Although we don’t have severe winters here our garden does go through a semi-fallow period featuring mostly greens and browns. While I love the purplish hue of the bare-branched plum tree, I felt a little bit sad as I walked around the yard yesterday. I even started to wonder if I had imagined how beautiful and lush it looks in spring. Then I noticed the nasturtium and I began to feel a little better. Nasturtium are often the first to bloom in our garden, their vivid yellow, red and orange faces popping up on thick vining stems with big, bright green leaves. Despite the fact that they grow like weeds here (or maybe because of it) nasturtium are, in my opinion, one of the best plants in the garden. They have a lot going for them. They are pretty, drought-tolerant, edible, and they attract pollinators. Hummingbirds regularly swoop down to drink from the blooms as do bees and occasional butterflies. They are also highly effective trap plants in the garden and, as an organic gardener, planting pretty flowers that help me control pests really appeals to me. 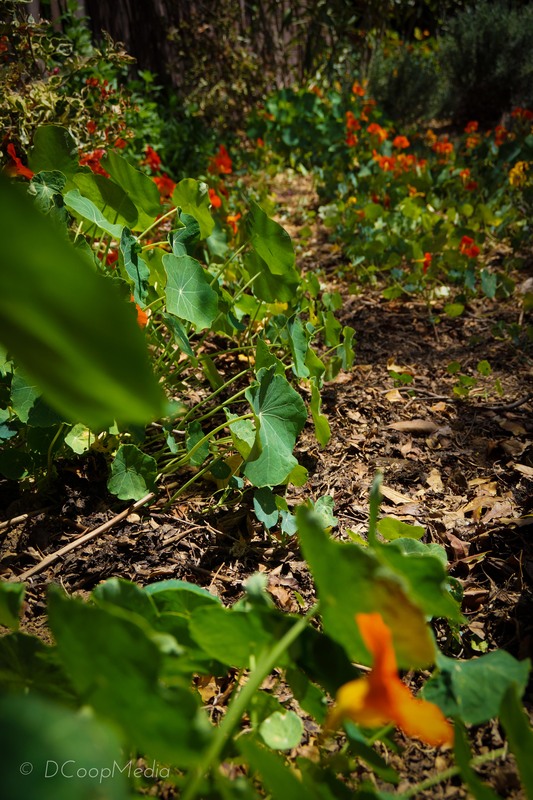 Trap planting is an organic method of pest control in which you distract pests from your cash crops by wooing them with something tastier. 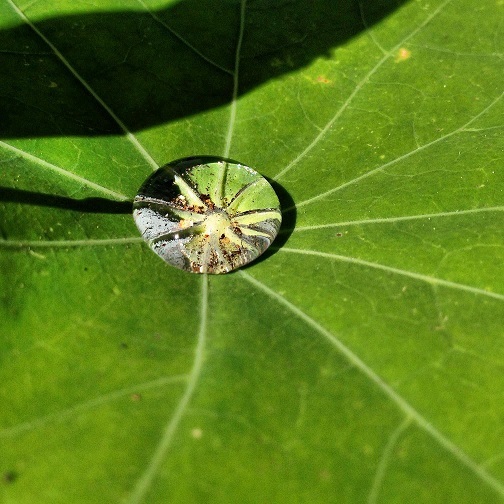 Aphids, flea beetles, cucumber beetles and squash vine borers cannot resist the taste of nasturtium and tend to gather on the undersides of those big green leaves. Instead of spraying my plants with chemicals, killing good bugs, bad bugs and all bugs in between, I just remove the infested leaves. This manages pests pretty well. I don’t worry about getting rid of them entirely because their presence attracts predators who, in turn, help control pests. 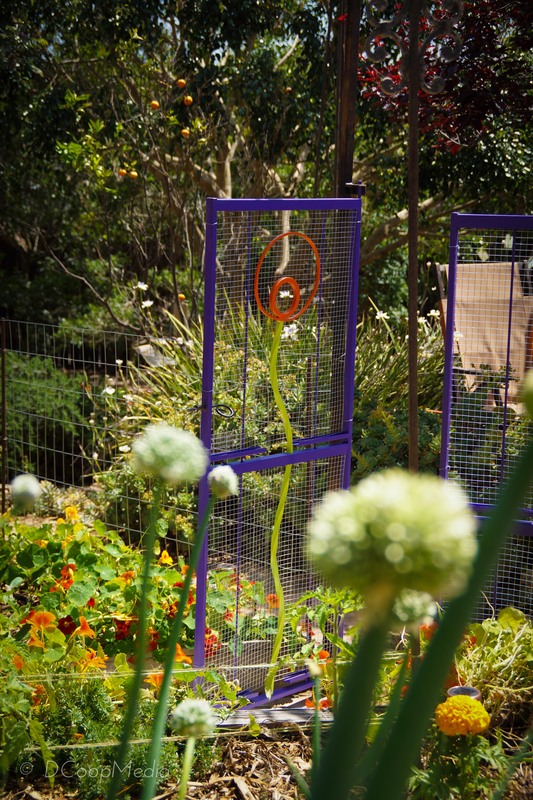 This is the beautiful symbiosis of organic gardening! And you know those sweet, white butterflies with the black spot on each forewing who float around the garden all spring and summer? Those little beasts are Cabbage White Butterflies, whose velvety green caterpillars can take down a lush stand of kale before you can spell cruciferous backwards. I don’t want to lose the butterflies, but when they lay their eggs on my organic cabbages, mustards, and Brussels sprouts I get a little miffed. As a cousin of these plants, the mustard-flavored nasturtium is a popular alternative, effectively trapping the pests where I can then dispose of them. I’m not growing any “cash crops” but I still want most of my crops to make it into the kitchen so I use trap cropping on a small-scale. 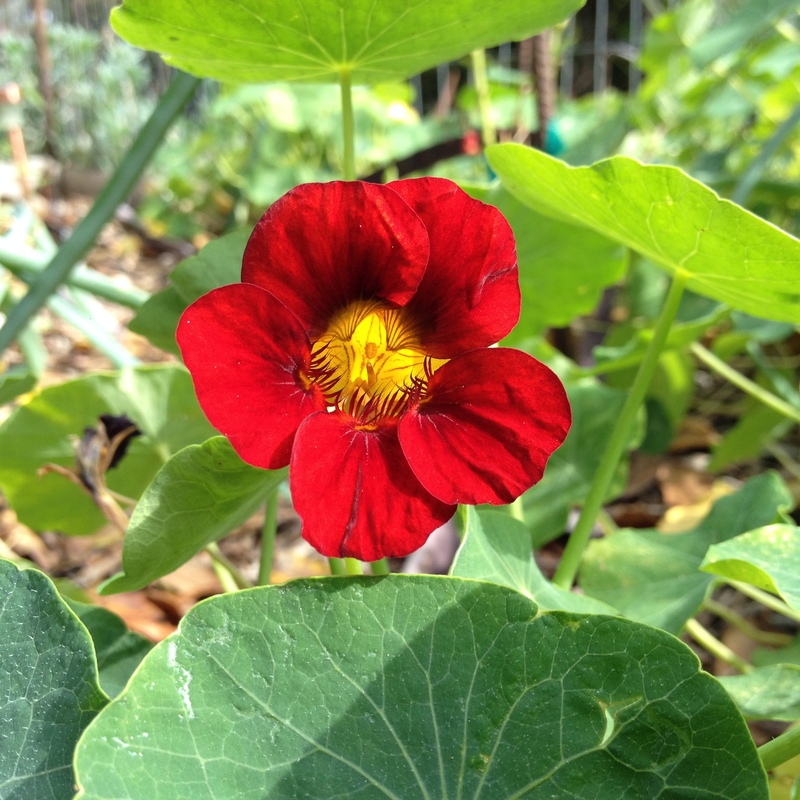 I like to grow nasturtium around the perimeter of my garden beds, allowing it to drape over the sides and spill those gorgeous flowers everywhere and attract the cabbage whites away from my food crops. Last year was actually the first time I put a lot of intention behind this plan. The first thing I noticed was that it looked gorgeous! As a bonus, it also helped keep the aphids and CWBs away from my crops (though my kale still suffered damage from cabbage worms, who were not impressed with my efforts). 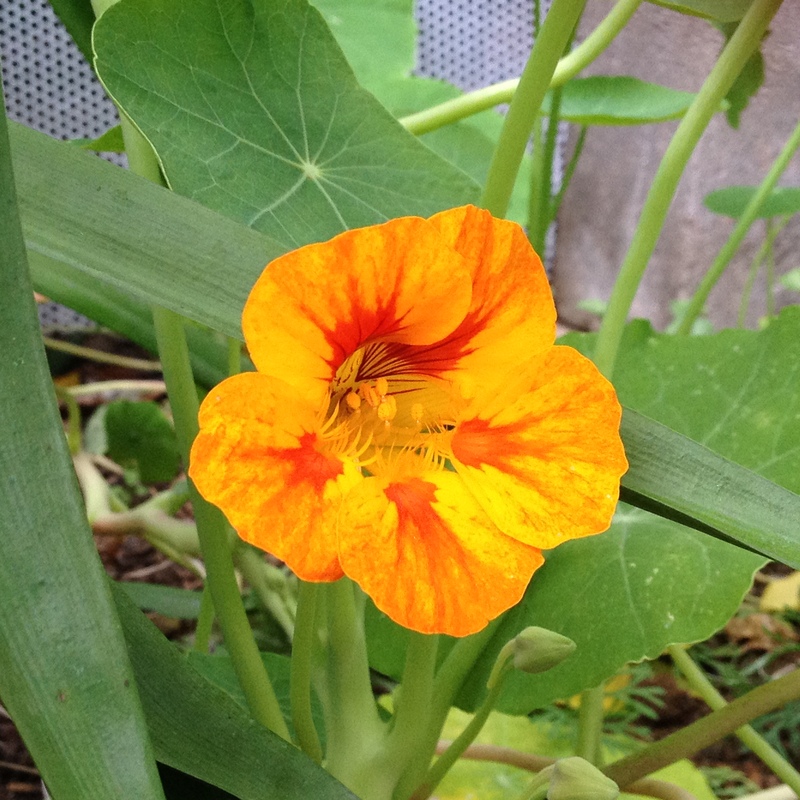 As I mentioned before, nasturtium are not just for bugs and birds. I think of the flowers as an alternative to arugula because they have a similar bite. 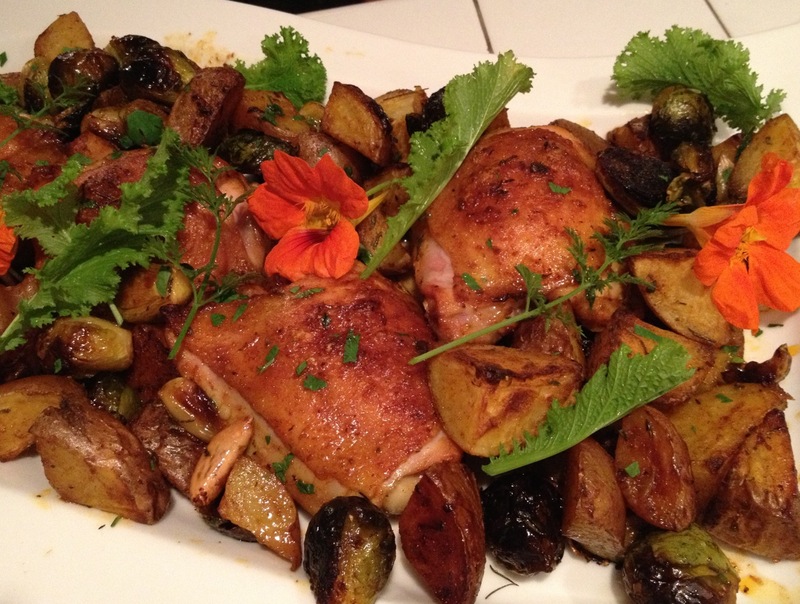 They can be eaten raw, adding a peppery note to everything from salad to roast chicken to frittata. The green seed pods are also edible. I’m not a fan of bitter food so they’re way too strong for my palate, but some folks eat them right off the plant. (And if we’re being honest, I’m weirded out by eating flowers. I’m trying to get better!) Last year I pickled several batches with fresh rosemary, lemon zest and thyme. The result was like a flavorful caper that was peppery instead of salty. Very interesting… very strong. If you decide to try it, pick the smallest pods you can find. 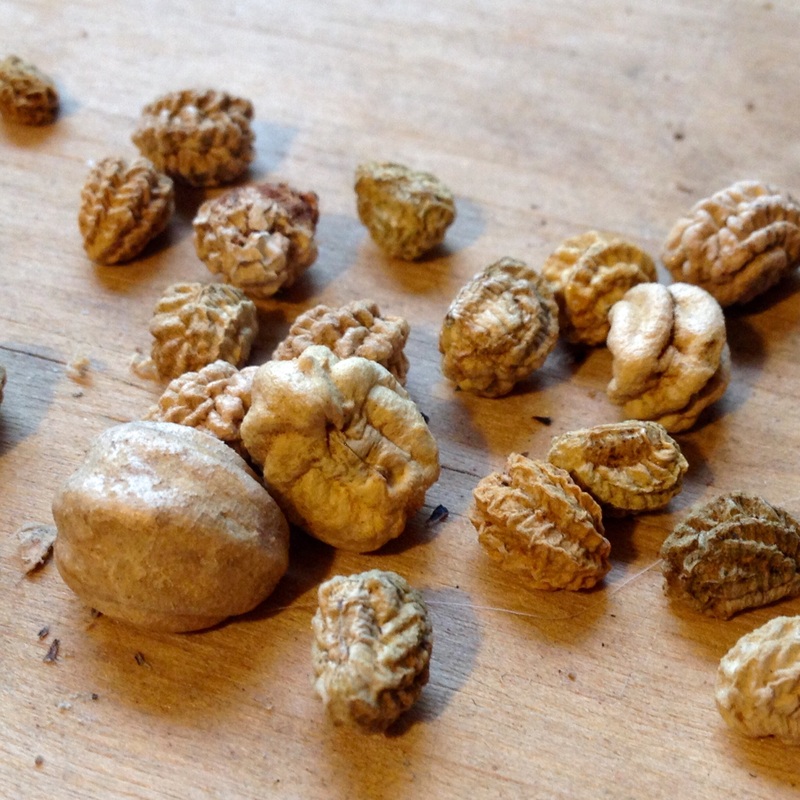 If you don’t pick the seed pods they eventually dry out, leaving behind hard brown seeds often still covered in a light brown papery wrapping. These guys re-seed with vigor! I recommend picking them while still green and allowing them to dry where you can keep an eye on them. Inevitably you will miss a few and they will pop up next year, but by collecting them yourself you can decide where you want others to grow next season. So there you have it, nasturtium in a nutshell. I hope everyone reading this will consider adding this wonderful plant to their garden, even just a pot on the porch will do. I promise you’ll be rewarded! This morning I awoke to a light rain and went outside just in time to see a beautiful male Rufous Hummingbird dive headfirst into a nasturtium blossom. This is a rare sight in our backyard as these beautiful boys seem to prefer the cape honeysuckle out front. It left me feeling grateful to these early-blooming plants for encouraging his visit and allowing me to think, for a moment at least, that my thumb might be just the slightest shade of green after all. One of my favorite plants! 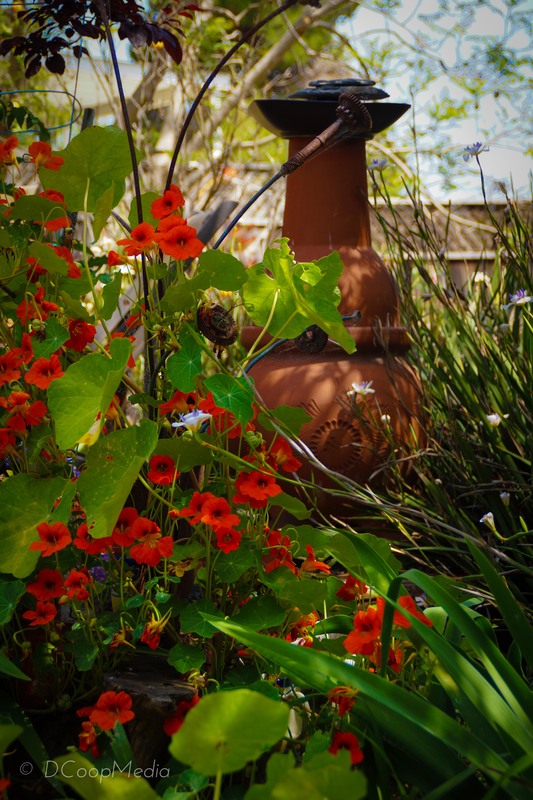 I always plant nasturtium throughout my Potager. I am now a shameless flower eater – devouring nasturtium, calendula, borage – all staples in my Potager. This year I am planting a beautiful nasturtium variety (I ordered seeds from Johnny’s) called Night and Day. Moonlight is also a favorite. I’ve heard of making pesto from nasturtium leaves and this may be the year I try it. Beautiful garden = beautiful photos! I’m so impressed and a little envious! I just have this texture issue… flowers feel very strange in my mouth. I’ll have to look at those other varieties for future planting, though I love the ones we have. And I have heard that pesto-rumor as well. Probably not for me but I bet it’s flavorful! I wonder what you’d use to balance the bitter, salt or lemon maybe? Oh WOW those moonlight and night and day are so pretty! And have you seen creamsicle? Yum. what a wonderful post! I like putting them in salads. I do understand the “eating flowers” thing-LOL. I do eat edible flowers, but I am careful when I am around small children. They don’t always understand which ones are “okay”. You should try pansies, they are tasty! Do you feel sad about leaving this garden? We have thought about moving, but I would miss my plants…but..more space, hmmm…that would make a difference! Yes, I am sad about leaving this garden, we absolutely love our home. If only we could pick it all up and move it to a bigger space, maybe a bit farther from the freeway… But we keep telling ourselves we created this wonderful sanctuary (despite a freeway, gas station and fire station as neighbors), just think what we can do we some real acreage! I just wish it could happen faster. I am really champing at the bit here! I think I need to order some nasturtium seeds! Thanks for an informative post. I hope you’ll come and share this on The Maple Hill Hop! Consider yourself pinned!